Chór Chłopięcy ‘Artos’ im. Władysława Skoraczewskiego, Chór Akademicki Uniwersytetu Warszawskiego, Chór i Orkiestra Teatru Wilkiego – Opery Narodowej / Michał Klauza. Teatr Wiekli – Opera Narodowa, Warsaw, Poland. Sunday, April 14th, 2019. 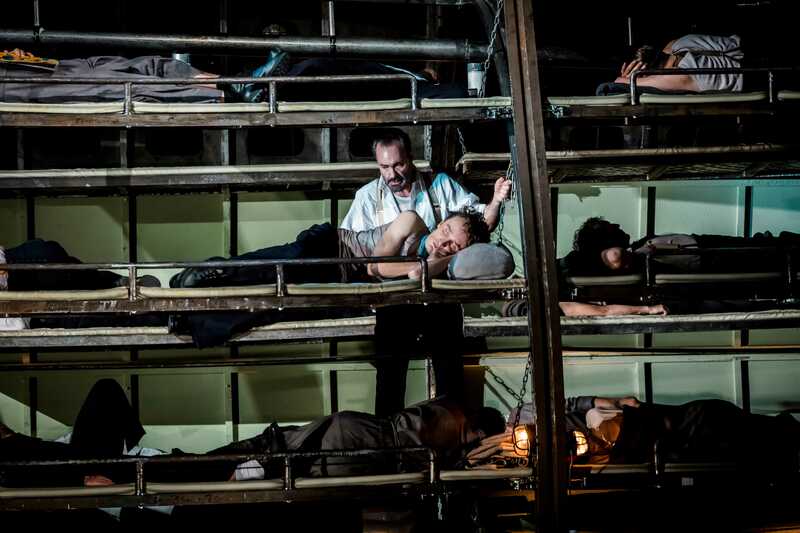 Tonight’s Billy Budd at the Teatr Wielki – Opera Narodowa, was only the second ever performance of the work in Poland. 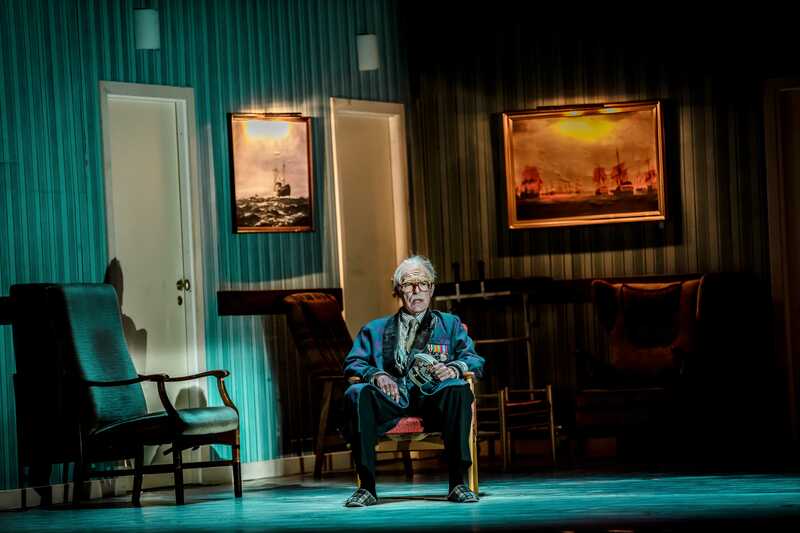 The first, was at the premiere of this staging by Annilese Miskimmon, imported from Oslo, two days ago on Friday. What was immediately noticeable was the clarity of the diction. It was almost universally excellent, rendering the bilingual Polish/English surtitles redundant. With my limited Polish, I could see no mention of a language coach in the program book, but the cast had clearly been superbly prepared by the musical team. Miskimmon’s staging is a cousin of her Liceu Puritani, in that initially, we get a reflection on memory. The curtain rises on the aged Vere reflecting in his chair in what looks like a nursing home. As the first act develops, the room is taken over by sailors, Vere’s memories coming to life, with the events in the plot overseen by the older Vere (played as the act progresses by a double). Then, Miskimmon introduces a serious coup de théâtre. The room disappears to the left and is replaced by an enormous cross-section of a ship covering the entire height of the proscenium. 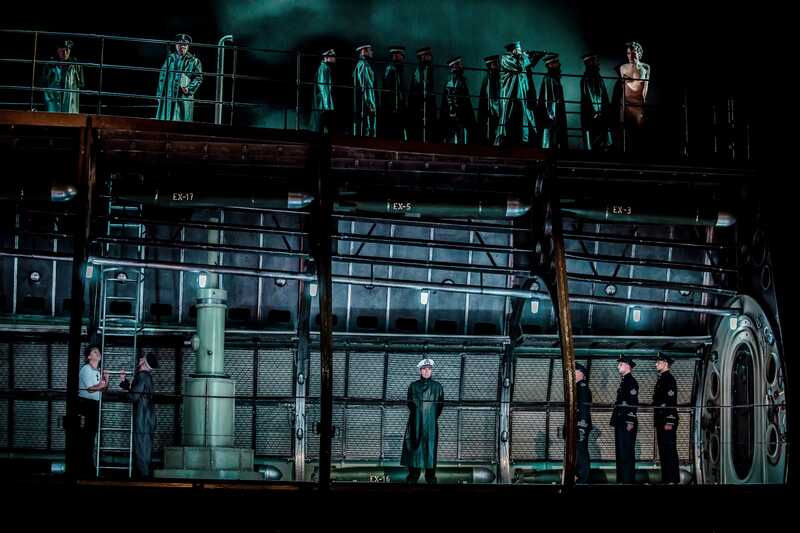 It looks spectacular (sets by Annemarie Woods) and allows spectators to gain a full impression of the micro-society operating on board the Indomitable. The cast is a group of clearly-defined individuals. We even see a pair of seamen grab a furtive moment of embrace, just before Vere confronts Billy. 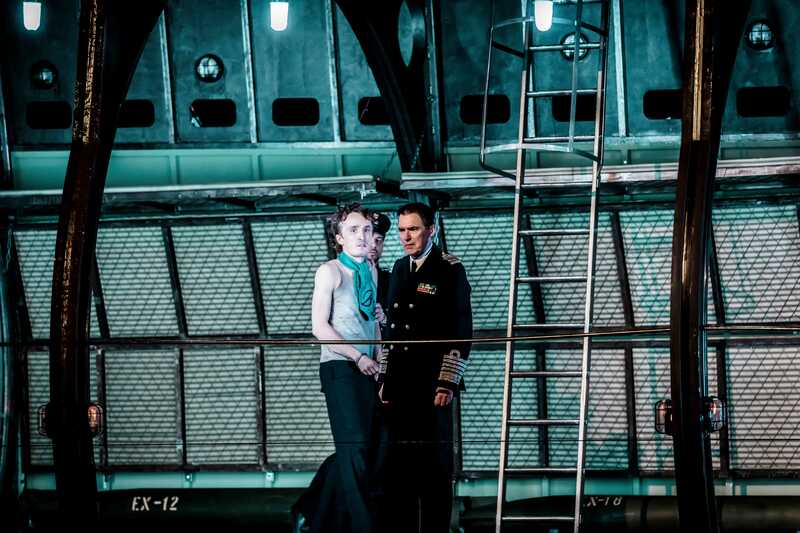 Similarly, the ship rises to reveal Billy imprisoned in the bowels of the ship for his ‘Billy in the Darbies’. There was something quite musical in seeing the ship rise accompanied by the craggy interlude. It provided a physical manifestation of the sound world of Britten’s music. Miskimmon’s staging is above all notable for its narrative clarity. It did feel that the presence of the double of the older Vere was a bit of an afterthought – he disappeared as the action moved to the ship itself – and I did wonder if it might have had more impact had he been present throughout. Similarly, a movie at the start of the evening showed a submarine, suggesting that the Indomitable lived under water, yet the officers were seen outside (or at least standing on what appeared to be a spacious outdoor deck) watching the mists. The submarine setting did however reinforce the claustrophobic atmosphere as well as creating a clear distinction between the world of the officers and that of the seamen. Musically, it was very strong. 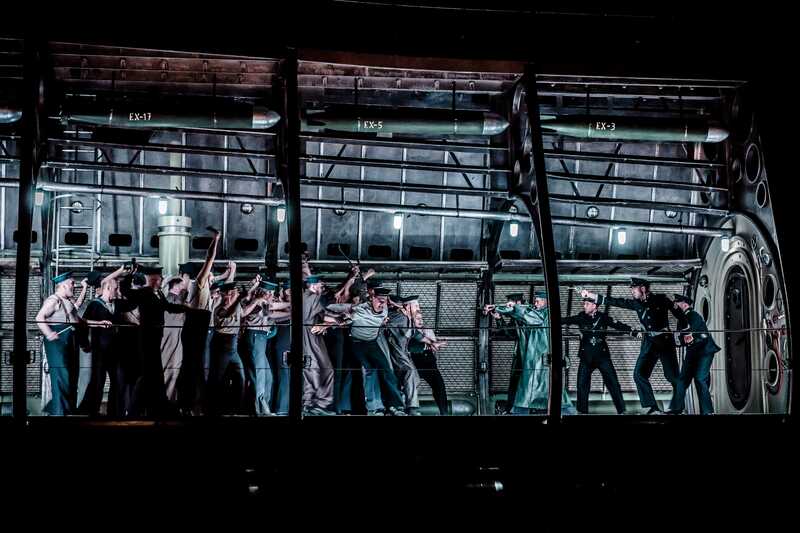 This is an opera that puts the chorus front and centre and tonight, the Teatr Wielki – Opera Narodowa chorus, augmented by gentlemen from the university chorus, really did exemplify the very best of the great Polish choral tradition. The unanimity of tone was staggering, the tuning and blend in Act 2’s ‘wind, wind fill our sails’ absolutely spot on, allowing Britten’s harmonies to emerge tellingly. They made a massive noise when required, filling the theatre with a wave of masculinity, and ensemble was immaculate all night. They had clearly been exceptionally prepared by Mirosław Janowski and Irina Bogdanovich. The cast also included a number of notable voices. Frankly, they could have double or even triple-cast the principals from the wealth of talent available in the ensemble. The house invited two of the principals, Alan Oke’s Vere and Gidon Saks’ Claggart. Both are experienced interpreters of their roles and of Britten more generally. Oke brought a lifetime of experience to the role of the Captain. His tenor ideally matched to the awkward tessitura, able to negotiate the passaggio with ease. The voice sounded believably old in the first scene and later his incisive, textually aware singing gave pleasure. Saks’ Claggart was also sung off the text. His bass-baritone is now somewhat dry and hollow, the lower reaches of the part not always there. Yet, he has charisma to spare and an undeniable stage presence. His intelligent use of dynamics in his big Act 1 scena made it absolutely gripping. Claggart is a difficult character to bring to life because he can so often feel one-dimensionally evil. Saks brought him to life as a convincing, sadistic bully. Billy Budd was sung by Michał Partyka. His was an active, believably youthful stage presence. His baritone is nicely resonant and healthily produced. His ‘Billy in the Darbies’ was somewhat too extrovert, missing the introspective depth of feeling that is ideally required. His tuning was also not quite à point. He had clearly worked hard on the text and his energy and command of the role were most impressive. In the remainder of the cast, Aleksander Teliga was a suitably gruff Dansker. Krzysztof Szumański’s rounded bass was a good match for Flint, indeed I would love to hear him as Claggart one day. 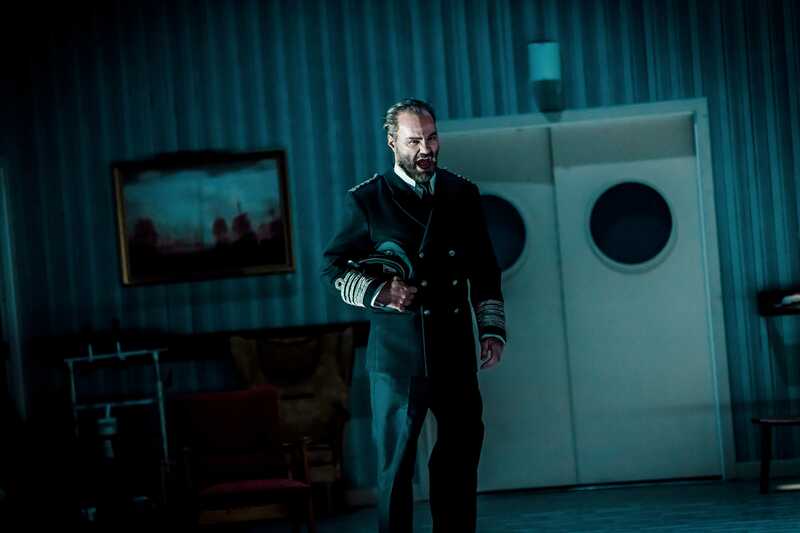 Mariusz Godlewski’s Redburn displayed a firm and resonant baritone and Wojciech Parchem offered a characterful and healthily-produced tenor as Red Whiskers, suggesting that he also could be a fine Vere. As Donald, Łukasz Karauda displayed a baritone of serious promise – a genuinely handsome sound combined with magnetic stage presence, surely destined for the title role at some point. The house orchestra was on good form for Michał Klauza. The strings producing gossamer lightness but also capable of sturdy force where needed. The presence of the saxophone added spiciness to the texture. The brass were well behaved on the whole, but there were quite a few split notes during the course of the evening. Given the unfamiliarity with the score, however, this was a very competent reading. Klauza certainly marshalled his forces well. Tempi were sensible but inclined to sag in places. The end of Act 1 felt tentative, not quite swinging in the way that it needed to. As mentioned above, the choral work was outstanding, easily the best I’ve heard this work sung and this is a piece I’ve seen in both London and Vienna. Tonight’s production was a milestone in the history of Britten performance in Poland. The cast had been extremely well prepared, the piece lived through the excellent clarity of diction and a very high quality of singing. Miskimmon’s staging was clear, logical and visually imposing, although there was one element that did feel like something of an afterthought. Tonight was certainly testament to the very high standards of the Teatr Wielki – Opera Narodowa. The huge cast was warmly received by the audience. Now, how about a Peter Grimes?